Comprehensive hearing evaluation from infants to adults. We offer comprehensive hearing evaluations for all ages. For most people, this means sitting in a sound-proof booth and listening to beeps. 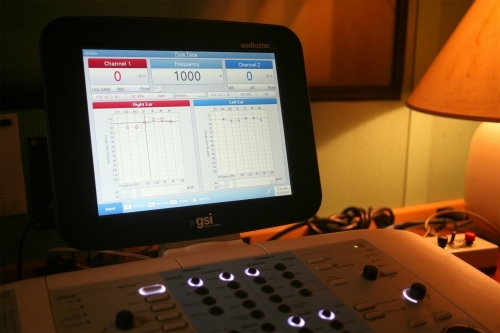 Our evaluations are diagnostic, meaning they are not just performed to fit hearing aids. We have the ability to differentially diagnose hearing loss of different types, assess the middle ear, and evaluate cochlear function. The type of testing you need depends on your symptoms. A full audiological report will be sent to your primary care physician, as well as any other referring physician, such as an otolaryngologist. We have special equipment and testing procedures for the evaluation of infants and children. There are many different factors to consider when choosing what hearing aid is right for you. This involves thinking about your lifestyle, the listening situations that cause you difficulty, and the financial cost of the hearing aids. Our audiologists work with you to select the manufacturer and model that will work best for you on all of these fronts. Once the decision is made, our job is not over. We fit all of our hearing aids to our industry’s “best practices.” This means that we verify that the output of the hearing aid is correct for your hearing loss, and we make sure the hearing aid is performing satisfactorily in the situations where you need them to work. We work with all of the “Big 6” hearing aid manufacturers. If your current hearing aids are “branded” (i.e. they are from Miracle Ear, Beltone, or Costco), we cannot work with them. Otherwise, odds are good that we can do a minor in-house repair for you, or send it to the manufacturer to be repaired if needed. We offer walk-in service from 8:30AM to noon and 1-4PM Monday through Friday. There are many things that can go wrong with hearing aids that we are able to fix quickly and easily in the office. You can walk in without an appointment during the hours above and we’ll be happy to assess your aids, clean them, and make sure they’re working well while you wait. What we can’t do during a walk-in appointment is adjust your aids. For that, you’ll need an appointment with your audiologist. We can take impressions of your ears for the manufacture of many different custom products, such as earmolds for hearing aids, hearing protection, swim plugs, sleep plugs, specialty hearing protection for musicians, and custom fit molds for earbuds. We offer simple wax removal in our office. Why simple? There are several conditions that make wax removal more complicated, making it difficult or dangerous to perform wax removal. These conditions are: diabetes, taking blood thinners, and/or having had otologic surgery in the past (such as a myringotomy, PE tubes, or mastoid surgery). For everyone else, we are happy to help clean your ears safely! We do not flush the ears, we use tools and a high-powered 3D magification system. For very stubborn cases, we’ll use a wax-dissolving solution. Keep in mind, Medicare does not cover wax removal when it is performed by an audiologist, so it will be an out-of-pocket expense for you of $25/ear. We sell hearing aid batteries of all sizes for $8 for an 8-pack. They are Duracell Active-Air, which we find provide the longest life. 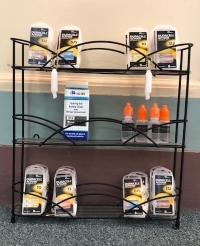 We also sell many accessories for hearing aids, such as oto-clips for retention, dri-aid kits for dehumidifying, and oto-ease for earmold comfort. No appointment necessary, just come on in! We are happy to work with school systems to make sure their FM systems are working appropriately, and help in the selection of FM systems that will work well with their students’ hearing aids. 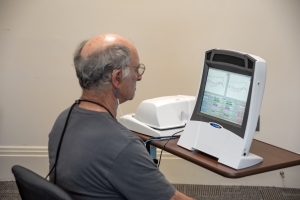 We have a lot of experience with hearing loss of all degrees and the types of devices that are on the market than can be helpful for those who are hard of hearing, from simple things like alarm clocks and doorbells to more complex issues like following lectures and hearing and understanding in busy restaurants. If you can tell us where you’re having trouble, we can help you find a solution.